A voluntary blackout. Total darkness. Sonic bodies delicately fill the space, probing all its nooks and crannies. What are the points of reference? How can we orient our listening? It we cannot see the musicians in the space in which they are playing, the perception of the music becomes global and constitutes a “sonic world”. Everything is part of the experiment, there are no longer parasites or noises, and there is an extension of listening. We can hear breathing, silences form notes, speech becomes incarnate. 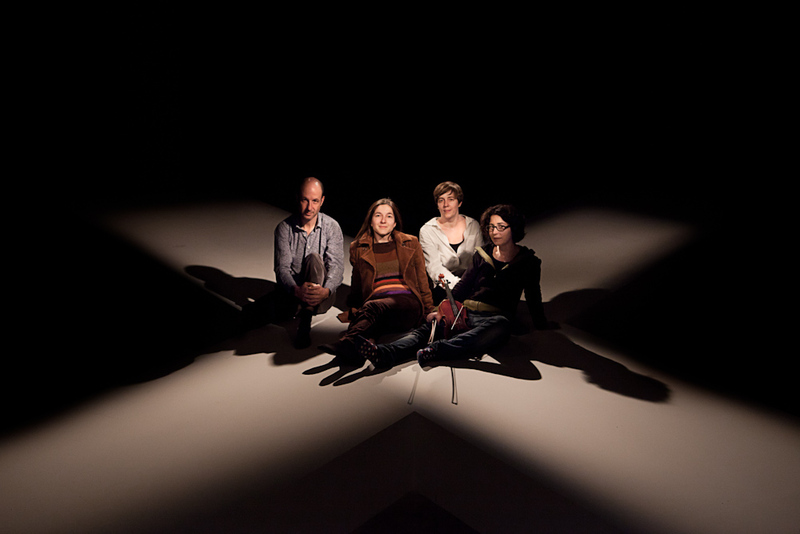 Starting from a mixed repertoire that includes contemporary music, folk music and improvisation, Anna D’Errico, Céline Hänni, Denis Schuler and Anna Spina offer an experience of place through hearing, developing an utterly original concert format. The four musicians play three times, three different repertoires, for a single sensory experience. The musical experience thus conceived eliminates sight to concentrate on the experience of the space through sound, also thanks to the organization of the hall, done by the architects Susann Vécsey and Christoph Schmidt, members of ISR 2012/13. The repertoire of Anna D’Errico ranges from classical music to that of the present, with a special interest in the latter that has led her to establish working relationships with some of today’s most intriguing composers. She is regularly invited to appear in many international concert halls and to take part in recording projects. She has worked with composers like Helmut Lachenmann, Salvatore Sciarrino, Enno Poppe, Georges Aperghis, Brian Ferneyhough, Beat Furrer, Rebecca Saunders, Heinz Holliger, and conductors of the caliber of Peter Eötvös, Lucas Vis and Matthias Pintscher. She collaborates with the Algoritmo Ensemble, under the direction of Marco Angius; she is a founding member of Ensemble Interface, and has appeared with Ensemble Modern and Ensemble Linea. As a teacher specializing in contemporary repertoire and techniques, she regularly takes part in workshops for composers and performers in Italy and abroad, and in interdisciplinary education workshops involving music and other languages. She was named Creator in Residence for 2013 at the Tokyo Wonder Site. After having graduated from harp and voice studies at the Conservatoire Populaire de Musique in Geneva, Céline Hänni entered the Conservatoire Supérieur in Lausanne to study harp with Chantal Mathieu, taking a diploma for teaching. Together with many experiences in orchestras and teaching, she has refined her singing in the class of Danielle Borst at the Conservatoire Supérieur of Geneva. A rebel of sorts, she has explored vocal experimentation through a wide range of traditions and styles. In parallel with interpretation of the 20th-century repertoire and the creation of contemporary works, she practices improvisation as well. A curious explorer of the arts, she likes to associate her sound research with theater and the graphic arts. A composer, musician and curator, Denis Schuler explores the terrain of music, drawing material from different spheres, including traditional music, improvisation and so-called occidental art music, comparing and combining multiple influences in a personal discourse. Through the study of rhythm and sound material, his work investigates extreme listening conditions, especially in the direction of silence. The music proposed by Denis Schuler relies on a particular capacity for concentration, where the ear often has to make an effort to perceive breath and noises. He creates spaces of sound reception that allow musicians to rethink the relationship with listeners, while offering the latter a chance for a different type of listening. Born in Geneva, Denis Schuler studied drums privately, then classical percussion at the Conservatoire Supérieur of Geneva, where he took a teaching degree. He then studied composition with Nicolas Bolens, Eric Gaudibert, Michael Jarrell and Emanuel Nunes. Born in 1971 in Bern, she studied viola at the conservatories of Bern and Zurich. She is an outstanding interpreter of contemporary music, and a very innovative, versatile player. Without denying her classical roots, she works in a wide range of areas: she has played as a member or musician in many ensembles from the Swiss contemporary music scene, including Collegium Novum Zurich, Contrechamps Genève, Quatuor Kairos Berlin, NEC La Chaux de Fond. She is interested in microtonal and spectral music, and has studied the scales of Arabian music (with the Egyptian violinist Abdou Dagher). She prefers to develop her interpretations in collaboration with composers, including works on Georges Aperghis, Giorgio Netti, Michel Roth, Elena Mendoza, etc; her repertoire ranges from the 20th to the 21st century. Anna Spina has produced many creations, and played as a soloist and chamber musician in international festivals. She has published a CD of solo works with the labels NEOS and Grammont. Susann Vécsey & Christoph Schmidt (CH): They founded their architecture studio ‘Vécsey Schmidt Architekten’ in Basel in 2007. Besides projects for buildings and competitions, they also work on architectural theory.